The composition of alnico alloys is typically 8–12% Al, 15–26% Ni, 5–24% Co, up to 6% Cu, up to 1% Ti, and the balance is Fe. The development of alnico began in 1931, when T. Mishima in Japan discovered that an alloy of iron, nickel, and aluminum had a coercivity of 400 oersteds (32 kA/m), double that of the best magnet steels of the time. Alnico alloys can be magnetised to produce strong magnetic fields and has a high coercivity (resistance to demagnetization), thus making strong permanent magnets. Of the more commonly available magnets, only rare-earth magnets such as neodymium and samarium-cobalt are stronger. Alnico magnets produce magnetic field strength at their poles as high as 1500 gauss (0.15 tesla), or about 3000 times the strength of Earth's magnetic field. Some brands of alnico are isotropic and can be efficiently magnetized in any direction. Other types, such as alnico 5 and alnico 8, are anisotropic, with each having a preferred direction of magnetization, or orientation. Anisotropic alloys generally have greater magnetic capacity in a preferred orientation than isotropic types. Alnico's remanence (Br) may exceed 12,000 G (1.2 T), its coercivity (Hc) can be up to 1000 oersteds (80 kA/m), its energy product ((BH)max) can be up to 5.5 MG·Oe (44 T·A/m). This means that alnico can produce a strong magnetic flux in closed magnetic circuits, but has relatively small resistance against demagnetization. The field strength at the poles of any permanent magnet depends very much on the shape and is usually well below the remanence strength of the material. As of 2018, Alnico magnets cost about 44 USD/kg (20 USD/lb) or 4.30 USD/BHmax. Alnico 5 magnet used in a magnetron tube in an early microwave oven. About 3 in (8 cm) long. These classification numbers, while still in use, have been deprecated in favor of a new system by the MMPA, which designates Alnico magnets based on maximum energy product in megagauss-oersteds and intrinsic coercive force as kilooersteds, as well as an IEC classification system. Advertisement by Jensen Radio Manufacturing Co. for Alnico 5 loudspeakers in 1945. As illustrated, Alnico 5 allowed a dramatic reduction in size and weight of magnet needed to produce a given flux, from 90 oz in 1930 to 4.6 oz. Alnico magnets are produced by casting or sintering processes. Anisotropic alnico magnets are oriented by heating above a critical temperature and cooling in the presence of a magnetic field. Both isotropic and anisotropic alnico require proper heat treatment to develop optimal magnetic properties—without it alnico's coercivity is about 10 Oe, comparable to technical iron, which is a soft magnetic material. After the heat treatment alnico becomes a composite material, named "precipitation material"—it consists of iron- and cobalt-rich precipitates in rich-NiAl matrix. Assortment of Alnico magnets in 1956. Alnico 5, developed during World War 2, led to a new generation of compact permanent magnet motors and loudspeakers. Alnico magnets are widely used in industrial and consumer applications where strong permanent magnets are needed; examples are electric motors, electric guitar pickups, microphones, sensors, loudspeakers, magnetron tubes, and cow magnets. In many applications they are being superseded by rare-earth magnets, whose stronger fields (Br) and larger energy products (BHmax) allow smaller-size magnets to be used for a given application. Contemporary artists have taken advantage of the special properties of alnico magnetics to make sculptures. ^ Hellweg, Paul. The Insomniac's Dictionary. Facts On File Publications. p. 115. ISBN 978-0-8160-1364-7. ^ Brady, George Stuart; Clauser, Henry R.; Vaccari, John A. (2002). Materials Handbook: An Encyclopedia for Managers. McGraw-Hill Professional. p. 577. ISBN 978-0-07-136076-0. ^ Cullity, B. D.; C. D. Graham (2008). Introduction to Magnetic Materials. Wiley-IEEE. p. 485. ISBN 978-0-471-47741-9. 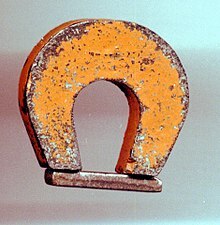 ^ Arnold-Alnico Magnets. Arnoldmagnetics.com. Retrieved on 2011-07-30. ^ Hubert, Alex; Rudolf Schäfer (1998). Magnetic domains: the analysis of magnetic microstructures. Springer. p. 557. ISBN 978-3-540-64108-7. ^ Frequently Asked Questions. Magnetsales.com. Retrieved on 2011-07-30. ^ a b "Standard Specifications for Permanent Magnet Materials (MMPA Standard No. 0100-00)" (PDF). Magnetic Materials Producers Association. Retrieved 9 September 2015. ^ Campbell, Peter (1996). Permanent magnet materials and their application. UK: Cambridge University Press. pp. 35–38. Bibcode:1996pmma.book.....C. ISBN 978-0-521-56688-9. ^ Chu, W.G; Fei, W.D; Li, X.H; Yang, D.Z; Wang, J.L (2000). "Evolution of Fe-Co rich particles in Alnico 8 alloy thermomagnetically treated at 800 °C". Materials Science and Technology. 16 (9): 1023–1028. doi:10.1179/026708300101508810.